Spyglass Entertainment originally was going to co-finance Dragonfly with MGM for $75 million, but MGM backed out due to the high budget and sent the project into turnaround. Spyglass then took Dragonfly over to Universal to co-finance and the studio signed onto the risky project. Even though the picture would be outside of director Tom Shadyac’s wheelhouse of goofy comedies, Universal took on responsibilities because they had made a fortune on his previous features The Nutty Professor, Liar Liar and Patch Adams. 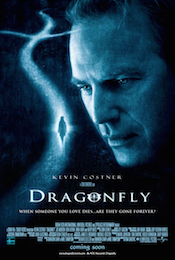 The studio’s goodwill toward Shadyac, was also enough for Universal to deal with Kevin Costner again, who had a feud with Universal executives a year before filming began on Dragonfly. After the studio trimmed the baseball pic For Love Of The Game (1999) down to a PG-13 rating, he went public with his displeasure about Universal and refused to due much publicity. Despite putting aside their differences to go forward with Dragonfly, Costner has not had another project at the studio. After Universal agreed to distribute in the US, the studio sold the foreign rights of the movie back to Spyglass. Spyglass then sold off most foreign rights to Disney through their Buena Vista Intl. label and Spyglass would distribute Dragonfly in Japan, Scandinavia and German-speaking territories. Universal originally planned for a fall 2001 release, but pushed back the date to January 2002 and then moved it again to February 22. Dragonfly received awful reviews from critics and Costner was just coming off the 2001 critical and box office disaster 3000 Miles To Graceland and had not had a hit in years. His string of expensive box office disasters began with The Postman (1997), continued with For Love of the Game, Thirteen Days and the travesty that was 3000 Miles to Graceland. Dragonfly also had marketing that misrepresented the film as a spooky ghost story with frights — trying to capitalize off of Spyglass’ success with The Sixth Sense. Dragonfly opened in 2,507 theaters against Queen Of The Damned and it pulled in a soft $10,216,025 — placing #3 for the slow weekend led by Queen Of The Damned. The pic saw a modest 35.2% second frame drop to $6,618,465 and held on with a 39.2% third weekend decline to $4,023,320 but closed its domestic run with a poor $30,323,400. Universal would see returned about $16.6 million after theaters take their percentage of the gross, which leaves about half of their P&A costs in the red and the budget at a loss. Dragonfly performed poorly overseas and was a disaster in the UK, where Costner’s reputation withered (3000 Miles To Graceland was straight to video in the UK) and it pulled in just $117,200. Spain posted the highest gross at $5.9 million and the overseas total was reported at $26.2 million. You can Buy Dragonfly on Amazon.